washed clean for the squirrels. waiting for Rainbow to take her up. Away her soul flies like a gliding bird. blending her colorful stripes into black fur. to envelope Mimi, to welcome her in. in rain and light on her flight to the heavens. again soon, every time I see Rainbow. 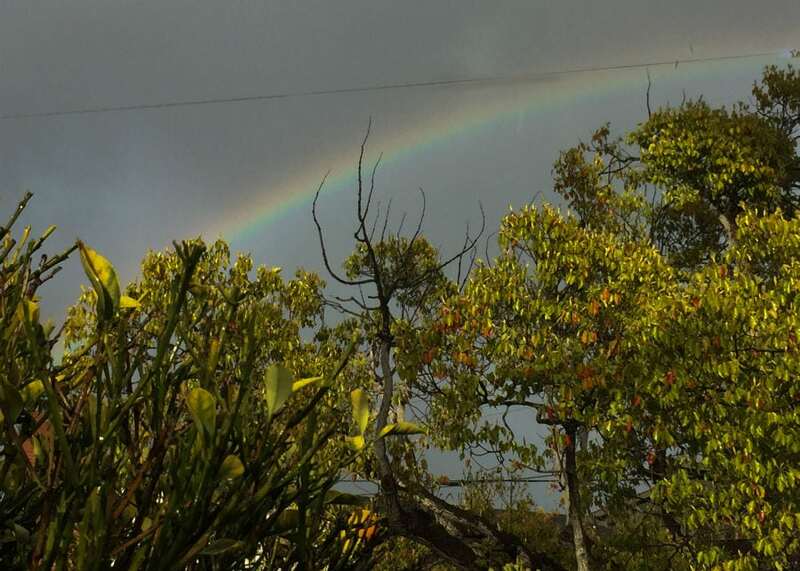 Poet's note: This poem and photo illustrate nature’s construct of a rainbow. It's so amorphous that it glows, then fades as quickly as it comes—just as life does, whether a cat like Mimi or a human like those of us reading this poem. Gayle Byock was a university administrator with positions such as an assistant vice chancellor of research and assistant dean. At age 70, she returned to earn her Ph.D. in Humanistic Psychology and Creative Studies, particularly poetry. She is developing a project using poetry to promote self-acceptance and self-empathy for women her age and older.